Having replaced my PAiA in my Ribbon controller, I decided to build a general purpose module with the PAiA. I wanted easy to change front panel switches so decided on the Mountain thumb switches since they were less expensive and had both a BCD (for mode) and a HEX (for channel) available. These switches are only read on reset so I added a front panel reset switch as well. I really like the MIDI connectors I use as they have no panel screws and are solid. I started the PAiA MIDI2CV topic on the Electro-Music forum. I drilled the pcb and mounted a MOTM-style 6 pin power connector. I also used a bit of epoxy to hold it to the board as there are obviously no plated through holes to solder to. I run this module off of +5, and +/- 15 volt supplies. All of the parts will work on the +/- 15 volt supplies except the CD4051B. It is specified to 20 volts maximum Vss to Vee. I ended up cutting the trace to pin 7 and inserting a 4700 ohm resistor in series with Vee. Then I added a diode with the cathode to pin 7 and the anode to ground. This regulates Vee to -0.7 volts so that the Vss to Vee voltage is 15.7 volts. The DIP switch circuitry uses the internal pullup resistors in the processor and grounds the signals. The BCD and HEX switches used connect only the appropriate signals so that '0' has no connections, and 'F' has all connections. This is backwards from what was needed. I installed a 74HC04 where the DIP switch was and used a resistor pack to pull up the inputs. I then wired the Mountain thumb switches to the inputs of the invertors for correct operation. With the BCD mode switch 8 and 9 wrap around to 0 and 1. One of the uses I have found for this is to expand my PSIM. 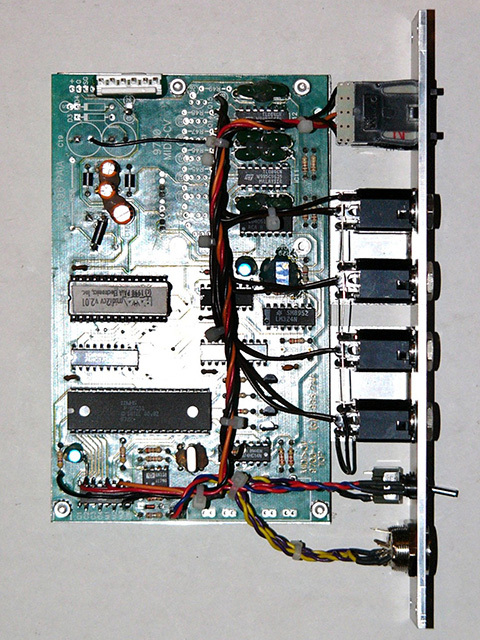 One of the modes is Continuous Controllers with eight 0 to +10 volt outputs. Sending a CC MIDI message from the PSIM is only two commands. Thus I can use my PAiA MIDI2CV to provide eight additional D/A outputs with little overhead. It is serial so there is a slight delay but I utilize running status to compress each CC message to two bytes resulting in a transmission time of ~5 mS.